Your daily dose of random and strange. 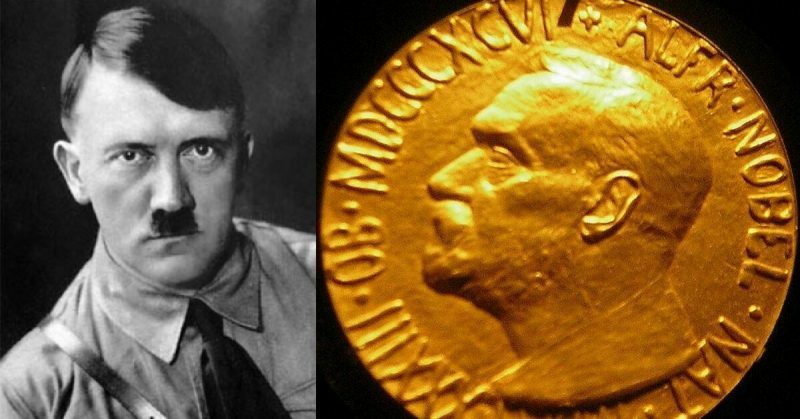 Adolf Hitler was once nominated for the Nobel Peace Prize. The prize has a long history, dating back to the late 1800s, and in 1939, Adolf Hitler was nominated for the Peace Prize. The history of the prize goes back to the late 1800s. Swedish industrialist and inventor Alfred Nobel left in his will that he would like to create a series of prizes, using the funds from his estate. The prizes proposed fell into several categories: literature, medicine, chemistry, physics, and peace. The award Hitler was nominated for was, of course, the Peace Prize, which has been given out annually since 1901. 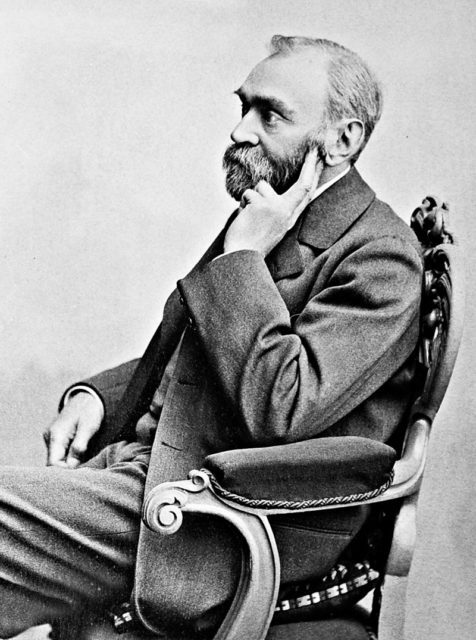 According to Alfred Nobel’s will, the Peace award should go to those who “have done the most or the best work for fraternity between nations, for the abolition or reduction of standing armies and for the holding and promotion of peace congresses.” Nominations for each prize were – and still are – to be chosen by a Norwegian committee. Today, the prize is still being given. Each December, the council narrows down their list of nominees to one. For reference, this past year there were 376 nominees. The final nominee, is, of course, the winner, and is granted the name Nobel Laureate. The list of winners and nominees of the Nobel Peace Prize is quite long. Anyone from U.S. Presidents such as Barrack Obama to affiliations like the Organization for the Prohibition of Chemical Weapons agency have won. The award has been given out 96 times, to 129 Nobel Laureates. This number includes repeat winners. In total, 103 individual people have won the award, while 26 businesses and organizations have won the award. 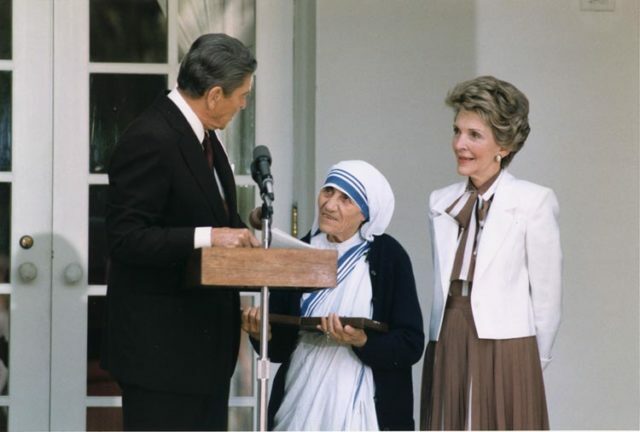 Mother Teresa (middle) seen in the 1980s with former U.S. President Ronald Reagan. Popular names that have won include the European Union, Martin Luther King Jr., Mother Teresa, etc. There have been several years where there were no winners, 1914-1916, 1918, 1923-1924, 1928, 1932, the year Hitler was nominated (1939) through 1943, 1948, 1955-1966 and lastly 1966-1967. The number of people who can be nominated to win the Nobel Peace Prize each year has been growing, and has reached a record number in the last few years. In 2016, 376 people and organizations were nominated. This is the most ever. In 2014, the old record was set at 278. 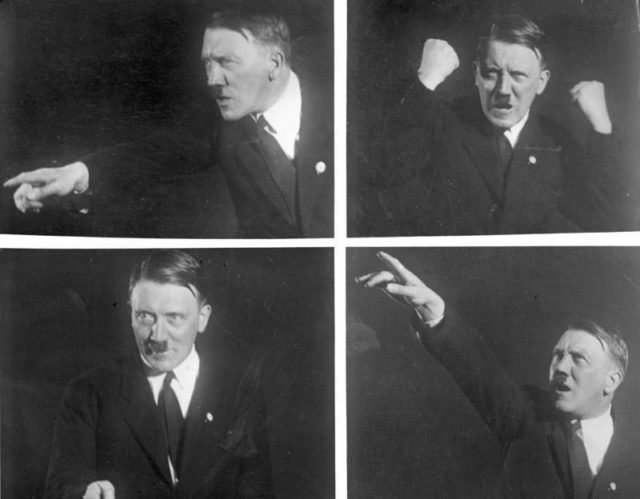 The year Hitler was nominated, 1939, the exact number of nominees is not known, but it was much less. Interestingly enough, Hitler banned anyone from Germany from receiving the prize in the mid-1930s. 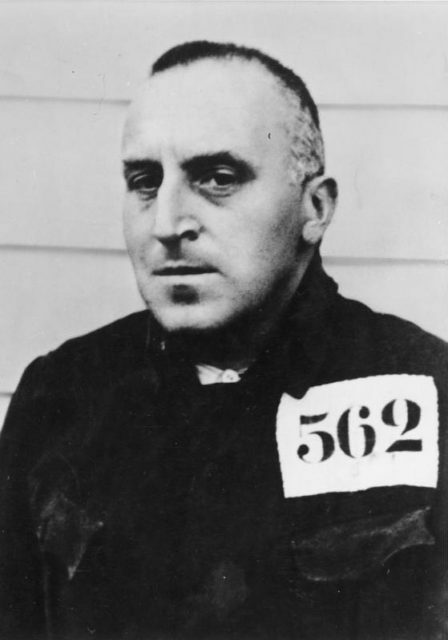 It all began when a German Pacifist, Carl von Ossietzky, was awarded the prize in 1935. Ossietzky was awarded the prize for exposing the German re-armament that had been going on for quite some time. The re-armament was in violation of the Treaty of Versailles, which was a peace treaty between Germany and the Allied countries, following World War I. The treaty required Germany to disarm. Once the re-armament was exposed, it came out that Germany had begun re-arming shortly after the Treaty of Versailles was signed. It’s also believed that by 1933, re-armament had increased substantially. Ossietzky was given the award for the 1935 Nobel Peace Prize in 1936. But he didn’t actually expose the German re-armament in 1935. It was 1931 that he exposed the re-armament. In turn, Germany charged him with high treason and espionage that same year. Ossietzky would spend several years in concentration camps and police custody until he contracted tuberculosis, dying in hospital in 1938. Ossietzky’s award caused some major disruption in the group that chooses who wins the prize, as the council didn’t believe a convicted criminal should be allowed to win the prize. This resulted in several officials stepping down. The Germans were unsurprisingly upset about the award, and Adolf Hitler banned anyone from Germany being allowed to receive the vote. He also banned the German media from even mentioning the award. Brandt was an anti-fascist and saw the nomination as a joke. Thus, he quickly took back his nomination for Hitler to win the award. He would go on to say that it was more of a critique of another nomination in that same year, British Prime Minister Neville Chamberlain. No, Adolf Hitler didn’t go on to win the nomination. In fact, as previously stated, no one did. From 1939-1943, there would be no winners of the Nobel Peace Prize. Even though the nomination was quickly taken back, it still churned out plenty of backlash. Brandt would go on to be labeled as many things, such as insane and a traitor. He was taken aback, and released the response in which he stated it all was meant to be an ironic joke. The Nobel Peace Prize has always been full of controversy. Since its inception, each award has been criticized due to the nature of how it’s awarded. Adolf Hitler’s nomination may have been a joke, but it makes you wonder, what would have happened if he had actually been nominated. What if he had won? It would have been truly ironic, with World War II starting, that, arguably, the main cause of the war, had won a Peace prize.